In the second of a two-part interview, Artistic Director of Together! 2012 CIC, Ju Gosling talks about the organisation’s vibrant ongoing programme of projects across various artforms and communities. 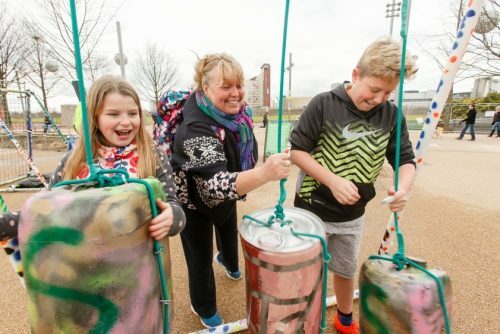 The Recycled Band was a Local Programme commission for Queen Elizabeth Olympic Park, and consists of 12 giant percussion instruments made of recycled construction materials and found objects. We built it with the McGrath Makers, a creative training scheme for people with learning difficulties, and held a concert conducted by Music Club member James Rose. Since then we have taken some of the instruments to a range of festivals, and are now planning to refurbish it. We’re delighted that James is a member of our Community Advisory Board, and to see his success. 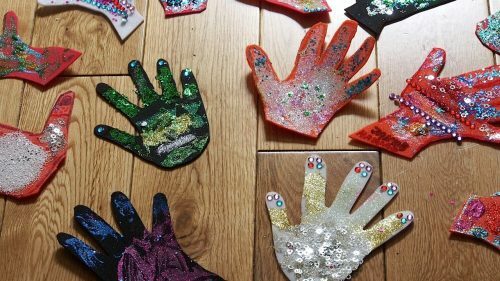 The Hands Project arose from one of our Carnival Arts projects, and is a participatory travelling exhibition with a human rights theme which is added to as it goes. Very simply, people create outlines of their hands, cut out and decorate them and we display them on long ribbons – the project underlines that we are all human, and all unique. If anyone reading is interested in hosting it, please let me know – individuals can also make and add their hands via the information on the website. The year-round Clubs programme runs most mornings at our community centre base in Stratford, although it is largely unfunded. The Clubs programme brings together emerging, mid-career and aspiring Disabled artists from across impairment, age and cultural groups to share skills and make work, alone and together. We programme the content to ensure that it can be accessed and is useful at any level, working across Film & Digital Art, Dance for Screen, Applied Arts, Drawing & Painting and Poetry. As we have added art forms and artists have experimented, we are finding that an increasing number of artists who attend regularly are working across art forms. We support this programme further by scheduling workshops led by external artists and companies as part of our Summer Together! and Disability History Month Festival programmes. 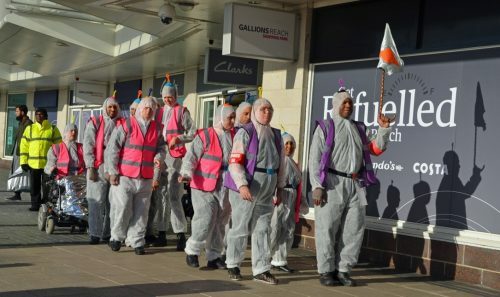 So for example we have had held dance workshops with Signdance Collective, Stopgap and Anjali dance companies, and poetry and spoken word workshops with artists such as Penny Pepper and Sean Burn. We also run a themed two-day workshop for Disabled filmmakers immediately before our annual Film Festival in December, with leaders such as Zata Banks from the Poetry Film organisation. And we have an ongoing Street Art and Carnival Arts programme, where individual artists come together with Starpad DJs, Act Up! Newham and Powerhouse women, and make work in association with Natural Theatre company from Bath and Paracarnival. In addition, we have a thriving monthly Music Club on the first Friday of each month, where as well as an Open Mic which I compere, everyone who attends is offered a choice of percussion instruments and encouraged to join in. The Music Club provides space for live musicians to learn and shape their craft, as well as a welcoming place for Disabled people and their friends to come. We have organised a range of offshoot projects, including a recording project for four artists; The Recycled Band; and an ongoing sea shanty project. We are particularly keen to support Disabled women to make music, as women continue to be so under-represented in the live music world. The Clubs are core, and we have a number of mid-career artists who attend, including those who simply find it easier to work in a group setting. I also lead a Professional Development Club, having worked as a careers adviser/mentor at Shape for several years, and Disabled artists can book one-to-one support with me on any Tuesday between 12-1pm. In addition, to date we have organised two residential sessions at Zinc Arts, focussing on issues like Access to Work and funding applications. For under-25s, we offer the Arts Award scheme, so that young Disabled artists can gain recognised qualifications, and we organise a session just for young artists on a Thursday morning. In addition to this, we create performance, exhibition, workshop leadership and screening opportunities for Disabled artists, both for the artists who attend the Clubs programme and those from across the UK and beyond. These opportunities take place largely during our Summer Together! programme, where we focus on professional development as well as showcase opportunities at larger events, and particularly during our annual Disability History Month Festivals. Prior to becoming an NPO, we were successful in obtaining Elevate funding from Arts Council England in 2016, and part of this funding has been invested in developing an online marketplace, the Together! 2012 Gallery. This will enable Disabled artists and organisations to sell a wide range of products online, with the fee – similar to eBay – going to support our free programme. Disabled artists face a range of barriers in marketing and selling their work, particularly since Disability Arts has not been picked up by any conventional gallery although we meet all of the criteria for collectability. Together! 2012 is currently recruiting artists to test the site by uploading their work and feeding back to the designers; email robin@together2012.org.uk if you would like to be a pioneer. Otherwise look out for further news on DAO soon. We aim to do what we say on the tin, as it were, and to work together with as wide a range of partners as possible. In terms of other NPOs, we liaise closely with the Discovery storytelling centre in Stratford, who run a Saturday morning artist-led project for Disabled children and their families. We showcase the Mighty Mega Saturday Club’s work within our projects, recommend Disabled artists to lead sessions, and support their funding bids. 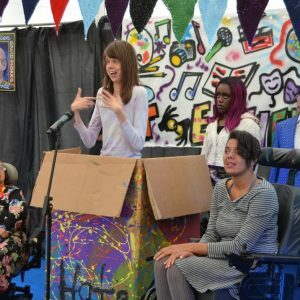 We also worked with Discovery last autumn to programme Disabled artists as part of the Newham Word Festival, and to programme jointly across the Word Festival and our Disability History Month Festival, which extended the opportunities available for Disabled artists. Another local NPO is the Museum of London Docklands, where we are a Community Partner. We have taken three projects to festivals that they have produced. First we took The Recycled Band to an environmental festival, and then we produced two of our Pop-Up Poetry Cafés at weekend festivals last year. This is a good example of Disabled artists leading activities for the general public as part of the Paralympic Legacy. We are also delighted that Rosetta Art Centre is Newham’s other new NPO. 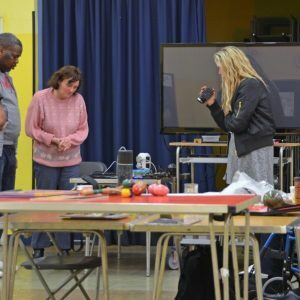 Rosetta provides artists’ training on a much more cost-effective basis than a degree, and is able to offer some free courses for people with learning difficulties. Many of Rosetta’s students are also Disabled, and we hope to develop a bespoke business course for Disabled artists with Rosetta next year. We are also working with Rosetta Art Centre and Forest Gate Arts to develop a local exhibition programme, there being no public art spaces in the borough yet. In addition, we have a growing partnership with Richard House children’s hospice, where we have delivered the Arts Award scheme for their Living Films project since 2014. As with so many organisations for Disabled people, Richard House has suffered severe funding cuts over the past 18 months, which have taken away all of their professional arts workers. As a result we now deliver a day of arts activities for the hospice each school holiday, and have taken over delivery of the Living Films project directly. We are also extending our Arts Award work at the hospice. Again, this work is largely unfunded, and we always welcome artists who can volunteer to support us with the delivery. We are using all of our experience with young people, who are facing increasing barriers to accessing further education, let alone higher, to feed into wider Arts Council policy via the Sector Support Organisation, A New Direction. We work with a range of partners on our annual Together! Disability Film Festival, which takes place on the second weekend each December in Stratford. Most recently, we added a highlights programme from Oska Bright, and this year we will also be screening an LGBTQI+ programme from Wotever Film. We are working ever more closely with Disability Film organisations throughout the year, including Oska Bright and 104 Films, as well as talking directly to the BFI and Film London. 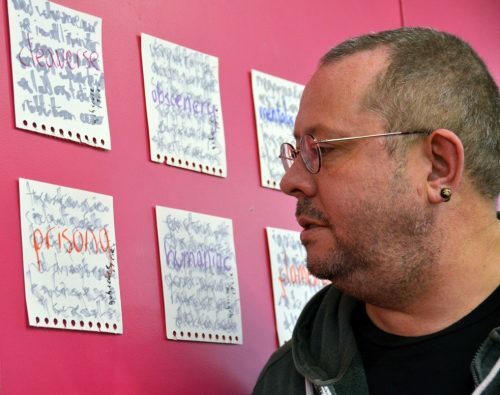 gobscure’s Prisong exhibition jointly programmed with Newham Word Festival. Photograph: Together! 2012. Further afield, we have partnered with the Vibrafusion Lab in Ontario and the Mobile Media Lab at Concordia University in Montreal on a two-year vibrational sound project which concludes this December. The project is funded by the British Council in Canada, and has included several workshops with David Bobier from Vibrafusion. Elevate funding has also enabled us to research and found the Together! 2012 Consultancy. 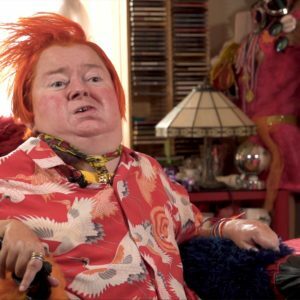 The Paralympic multi-gold medallist Robin Surgeoner MBE, known to DAO readers as the artist and musician Angry Fish, is leading on all of our income-generating business development, while I lead on the artistic and organisational development. The consultancy focus is on making organisations ‘Inclusion Confident’ – Disabled people come from across age, cultural and religious groups and from the LGBTQI+ communities too, so we don’t believe it’s possible to look at Disability in isolation.